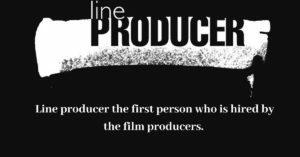 Line producer is a first person who is hired by the film producers. They handle all the business aspects of the film production—means they try to put everything in line for only one film. They are known as line producer because they fix the above-the-line cost for writers, cast member, crewmember, directors, and below-the-cost for everything else required in a movie. The script is given to the line producers for the development to access the below the line production cost. They decide the screenplay of the shot—means they break down it in a timetable that determines how long it will take to shoot one scene. Line producer schedule and estimates the cost of shooting each day. They produce a temporary budget to demonstrate the total amount required for funding. Once the producer raises the finance, the film will schedule for pre-production. Throughout the pre-production, directors, production managers, art director, first assistant director, and other department heads engage the line producers in preparing the production schedule, film set, and budget. Technically, the line producer manages other pre-production activities—from hiring a production team, setting up the production office, dealing with site scouting, suppliers, selecting crew, and sourcing gadgets for the movie. Line producers hire most of the supporting side actors, contributors, and motion picture artist. How They Manage The Production? Through the production, the line producer gives the responsibility to manage the final budget of movie shooting to the production accountant. They hand over the day-to-day processes of the production to the manager and coordinator of production. However, the line producer is the main person to oversee everything—making sure the film production is complete within time is the specified budget. Working on Film Shooting in Uttarakhand, remote location needs a head to take care of everyone’s need including health and safety parameters, food, equipment for shooting, shorting out an insurance claim, and at the end of the shooting, they oversee the winding up the things of shooting and production. The Line producer works on the freelance basis. Why Uttarakhand for Film Shooting Location?